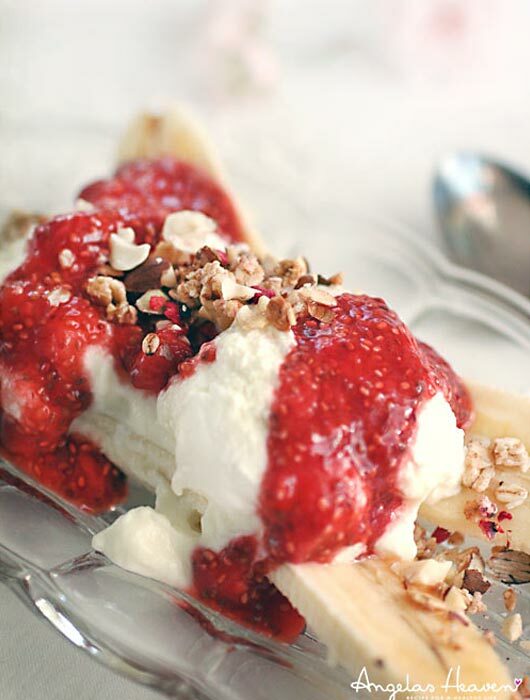 My favorite breakfast….healthy banana split! You have to try this recipe. It’s so good, satisfying, easy to make and healthy. Perfect as breakfast or a snack. I’ve been enjoying this breakfast the last couple of days and I love it. 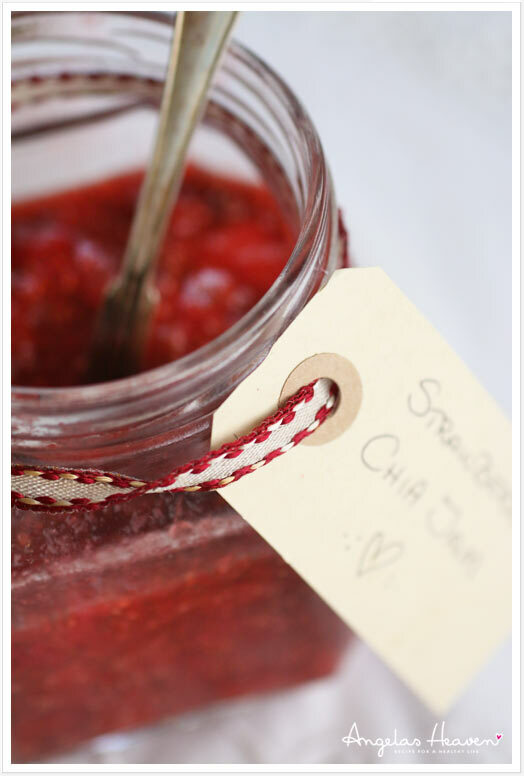 You’ll make the strawberry chia jam in just a couple of minutes and then it will last for several days in the fridge. I swirl my jam into my morning yogurt, with my gluten free pancakes or spread over toast with peanut butter. It’s a great alternative to ordinary jam with sugar. I usually make my chia jam with organic strawberries and I usually use frozen strawberries (since I live in Sweden and we have winter most of the year), but you can use any kind of berries. Stir in a couple of tablespoons chia seeds (lots of Omega 3’s) and within a few minutes, the chia seeds will absorb the fruit juices and thicken it to a jammy consistency. The best ratio of fruit to chia seeds is two cups of fruit to two tablespoons of chia seeds. Start with this ratio, then if your fruit was very juicy or you’d like a thicker consistency, stir in more chia seeds one teaspoon at a time. 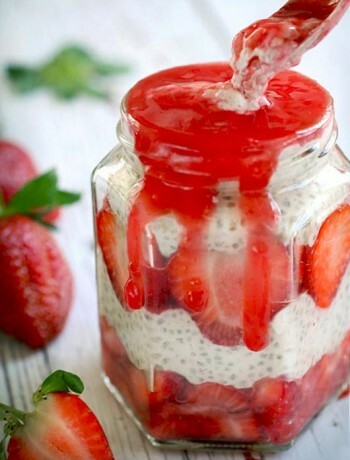 Stir in the chia seeds with the strawberries. Use a fork to mash the berries to the consistency you like. If you’d prefer not to have visible chia seeds in your finished jam, puree the jam in a blender or with an immersion blender. 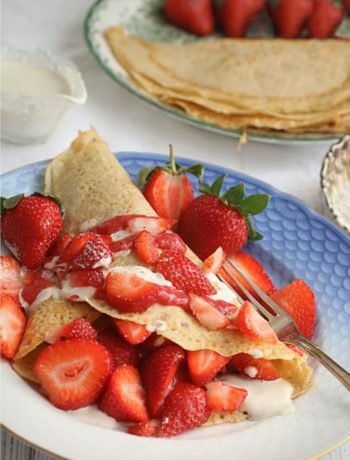 Once you’ve got your berries to the right consistency, add the chia seeds. Mix it all very well and allow to set in the fridge, about half an hour. Taste and add agave syrup or honey if you would like a sweeter jam. Enjoy! Divide the banana in two halves and place it on a plate. Add a generous amount of greek yoghurt. 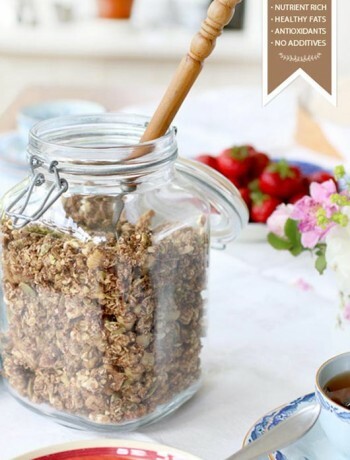 Add your chia strawberry jam, granola or nuts and agave syrup.